Pink Roses with a soft cream undertone. Professionally designed in a vase with greenery and filler to compliment. Amazing quality sure to put a smile on their face. 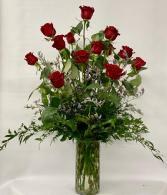 Medium stem Roses arranged in a Vase with greenery and accents. 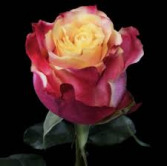 This roses shorter stem makes it up with its exceptional color. 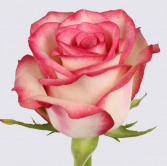 This two tone rose will surely impress your Valentine. Darker pink outer petals then peachy/creamy center. This Rose opens amazing and is amazing watching this rose open. 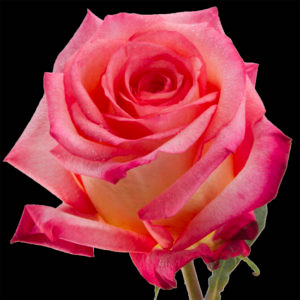 The term Russian Cut refers to roses that are cut when they are more mature (the petals are opened slightly), as opposed to cutting them when they are in the tight bud stage. Growers will wait an extra week or two before harvesting or cutting the stem. The extended growing period will give the roses more nutrients to develop its flowers, stems and leaves. Russian-Cut roses tend to have larger flower heads and longer stems than other roses. While they are also a bit more expensive than regular roses, Russian-Cut flowers can last longer than roses that were cut earlier! Russian-Cut roses are sometimes known as "Designer Cut."